Located in Atlanta, Georgia, on the Georgia Tech campus, Bobby Dodd Stadium at Historic Grant Field has been home to the Georgia Tech Yellow Jackets since 1913. Named after Georgia Tech's legendary coach in 1988, the facility is the oldest and winningest football stadium in Division I football. Originally built to accommodate 5,600 people, the stadium at Georgia Tech has had a series of expansions that now allow 58,000 spectators at every Yellow Jackets game. 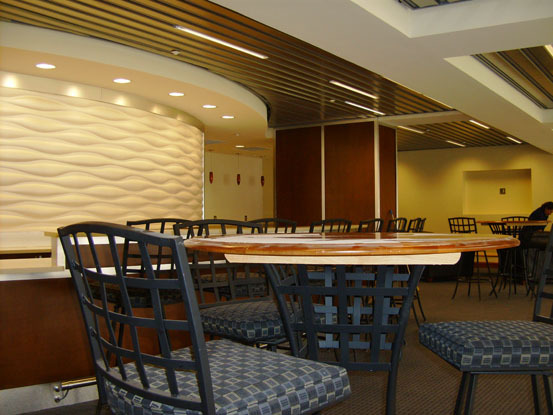 The most recent additions and renovations occurred in 2009 and included the renovation of the ISP Sports Network Suite. The project was designed by architects Populous and featured ceilings by Hunter Douglas Contract, which provided Box Series and Deep Box Series ceilings to give the new suite the sleek look of a hip sports bar. "The Multi-Box design for the Linear Metal Ceilings offered a clean, elegant look that meshed with the renovation needs and installation requirements of the space," says Ron Rice, General Manager for Hunter Douglas Ceilings. 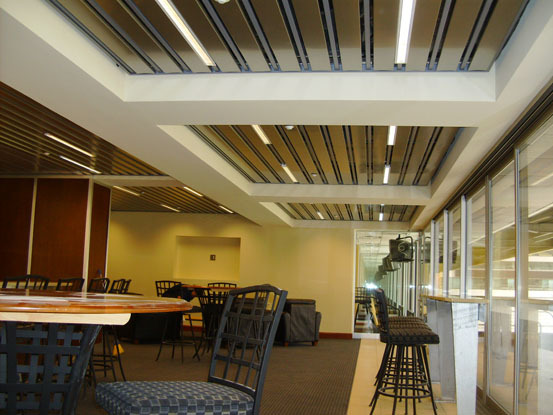 "The aluminum panels also contain up to 95% recycled metal, making this sustainable choice for the ceilings."